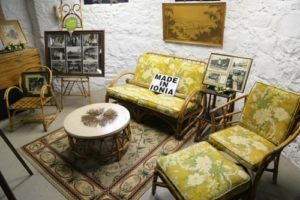 The Blanchard House is intended to showcase what upper-class life was like in the late 1800s, but of course there is so much more to share of Ionia’s near-200-year existence, and the heritage of the people who lived here before it was called “Ionia.” The ICHS has collected thousands of documents and thousands more artifacts from the history of the Ionia area. 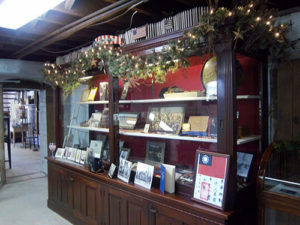 So in the 1990s, the basement level of the Blanchard House was dedicated as our own local history museum. In that limited space, we try to convey aspects of Ionia from the early inhabitants to the near past. There are four rooms in our museum. The first is focused on the Indians, the first white settlers, the pioneer lifestyle, and early industry. 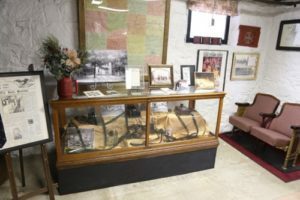 Next is a room that showcases artifacts from several local businesses with long histories in the community, as well as some military artifacts. The third room has displays of local institutions and government. The fourth room is divided between artifacts of Ionia business and industry and our local healthcare history. Every closet and bookshelf, the attic and the carriage house, are filled to capacity with wonderful stories we’d love to tell. But we simply don’t have the room to put these things on display. We also desperately need room to catalog and preserve all these treasures, and make them accessible to the community. So someday we hope to have a dedicated museum facility. For now, we do the best we can, and we hope you can visit our modest little museum to learn something of our fascinating heritage.